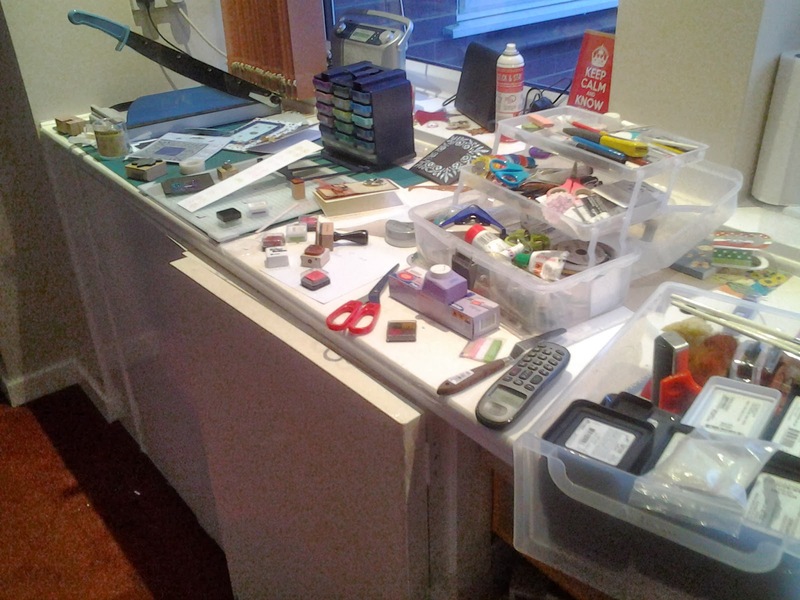 Well my worktop today is very busy, or a bit of a mess, depends on your point of view. 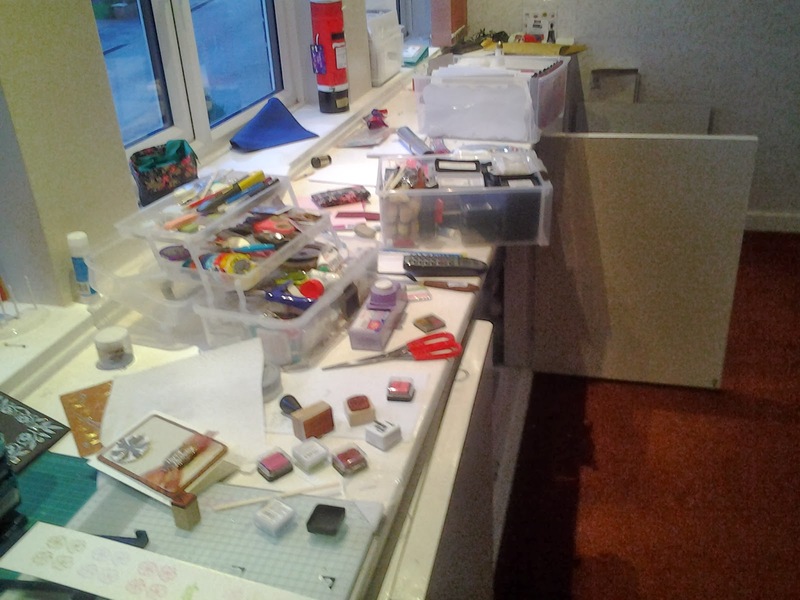 I've been away for over a week, and when I got home the priority was clearing everything out of my study so that I could have a new carpet laid this afternoon so I had done no crafting for more than 10 days. As a result I was getting withdrawal symptoms so have done a lot of playing today, and pulling lots of things out of the cupboards. 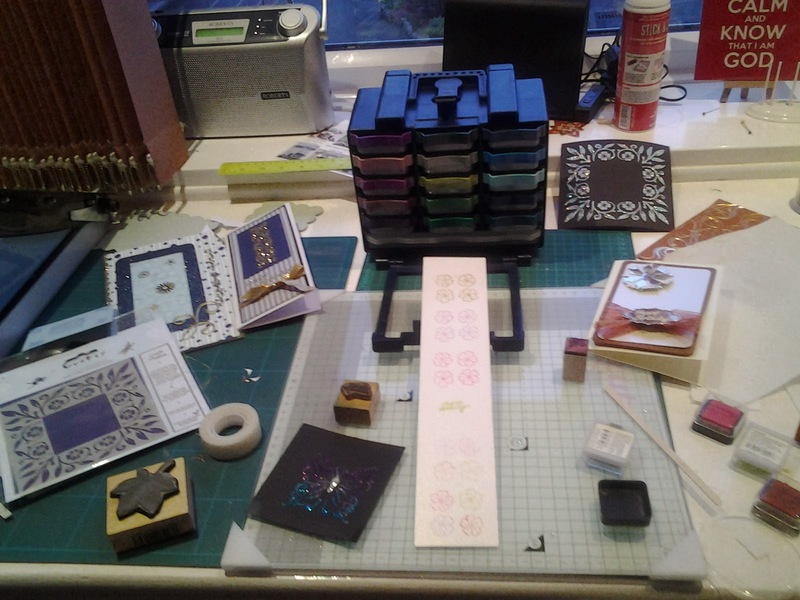 This shows the worktop from the other end with lots of mini ink pads, a couple of stamps and right at the front are some stamped flowers drying before I can colour them. So a full frontal of the desk shows those stamped flowers more clearly, and the other thing I was playing with, which was masks and sparkle medium. The mask on the left and the piece I did with it back right, and a butterfly at the front left. 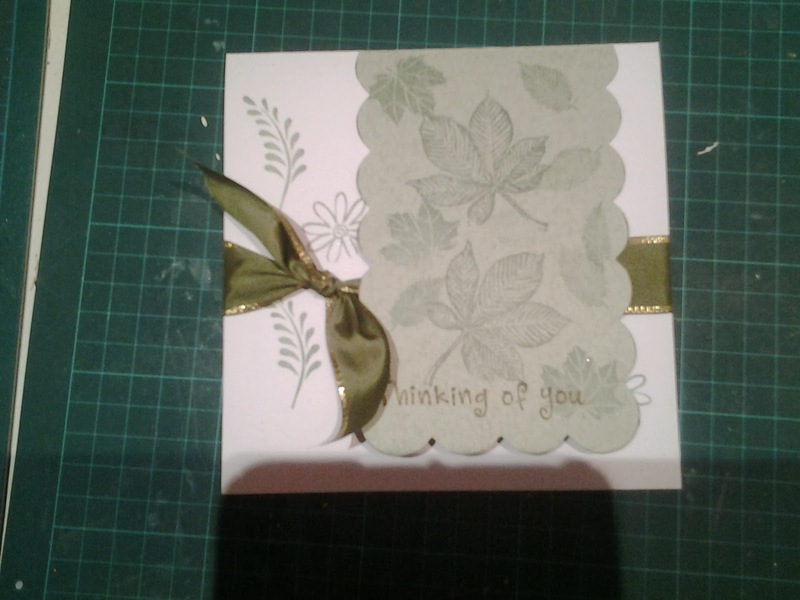 And,...... drumroll...... here is my final stamped card! I am rather pleased with the result, I will do more stamping. And if you have just randomly arrived at this page and are wondering why I am wittering about my desk, click on the link and you can visit Madame Julia and there you can find links to peruse a hundred or so more desks. Morning, Chris. Glad to see you back home and having fun. Hope you like the new carpet - see you later - kettle will soon be on! Ah, the desk is a sight to behold, and no, not messy to me at all! Nice stamping - it takes but a little practice and no fer of over inking in my opinion...don't wipe the ink pad onto the stamp, tap it firmly and just apply firm equal pressure...job done! Happy WOYWW. Well it looks like you are already a proficient stamper. Love the finished card. Ali x. #56. I am truly impressed with your stamp pad holder. I've never seen one like it before. Like you, I'm not much of a stamper, but Julia has tried to make a stamper out of both of us, it seems. I love your card. It is fantastic. I would give it a BIG thumbs up. Chris, I had intended to answer your questions, but hit send too fast. First, I have about 460 rocking horses. I haven't counted them in awhile, so there may be more or less. The last time I counted, I had 447. I made these backgrounds specifically for two challenges I am in. The first one is on my blog right now. I do sometimes make a few backgrounds ahead, though, and cut them to size as I need them. These are file folders, though, and they are for specific challenges. Hope that answered your questions. Awesome lot of fun things out on your desk. Love all the paper crafting goodies. Thanks for visiting my desk and leaving a comment. I love to hear from others. Vickie aka Okienurse.